Perception is not reality. The data that companies self-report is focused mostly on its policies and intent. A company that is good at communicating and “spinning” its story could raise its ratings on the system to a level they do not deserve. Of course, as more data is secured—especially from bottoms up “crowd” sources—this type of behavior will likely eventually be detected. A Governance Metric tool called Audit Integrity used to do this type of sleuthing on corporate financial reports. We believe the benefits of using a Big Data approach to measure corporate social responsibility and sustainability performance far outweigh the drawbacks. A Big Data system can be extended to include thousands of smaller companies and organizations. We are expanding our universe of coverage while we keep narrowing down the “error bars” in our ratings. We have discovered several areas that appear driven by sustainability factors. 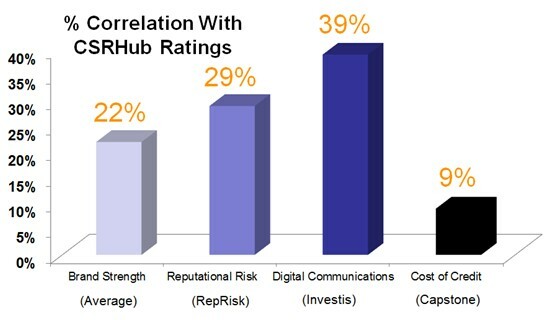 For instance, we have connected our data to measures of brand strength, risk, communications quality, and cost of credit. We compare each source’s ratings with those for all other sources. 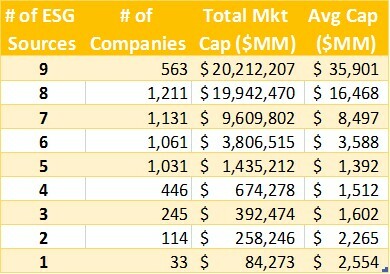 Each company we study gives us more opportunities to compare one source’s ratings with another. The total number of comparisons possible is very large and growing, exponentially. We use the results of our comparison to adjust the distribution of scores for each rating source so that they fall into a “beta” distribution that has a central peak in the 50s. It may help explain our data analysis process by using a specific example. (Note that we are using an example from 2014 for a company that has since been split into two parts. This avoids any risk of an implied criticism of an existing company.) Hewlett Packard was a heavily tracked company prior to its split. 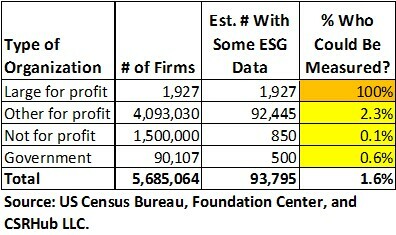 We had 154 sources of data for this company that together provided 17,571 individual data elements. Only 62 of these data sources provided data for our July 1, 2014 rating—the rest of the data sources provided data for previous periods (our data set goes back to 2008). The 62 current data sources provided 575 different types of rating elements and a total of 610 different ratings values that did not affect/apply to special issues. Before we could present a rating, we needed to check first that we had enough sources and enough “weight” from the sources we had, to generate a good score. In general, we require at least two sources that have good strength or three or four weaker ones, before we offer a rating. As you can see, we had plenty of sources to rate a big company such as HP. Even after normalization, the curve of ratings for any one subcategory may have a lot of irregularities. However, we had enough data to provide a good estimate of the midpoint of the available data, for those ratings we collected and adjusted. Below you can see that some sources had a high opinion of HP’s board while others had a less favorable view. 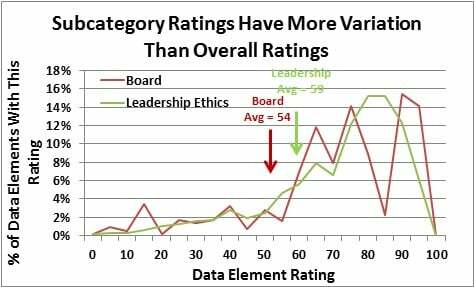 The result was a blended score that averaged to less than the more uniform Leadership Ethics rating. The overall effect of our process is to smooth out the ratings input and make them more consistent. 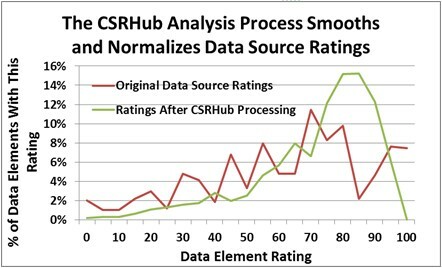 As you can in the illustration below, the final ratings distribution was organized well around a central peak. The average overall rating of 64 was below the peak, which was around 80. The original average rating was 61. By making a few assumptions about how the errors in data are distributed, one can assess the accuracy of ratings. 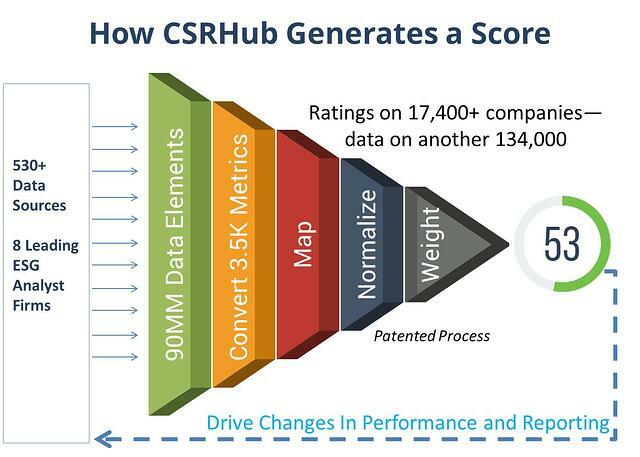 In a previous post, we showed that CSRHub’s overall rating accurately represents the values that underlie it to within 1.8 points at a 95% confidence interval. Our error bars have continued to decline and now are less than 1 point at this confidence interval. Did you miss part 1? See part 1 here. Bahar Gidwani is CTO and Co-founder of CSRHub. He has built and run large technology-based businesses for many years. Bahar holds a CFA, worked on Wall Street with Kidder, Peabody, and with McKinsey & Co. Bahar has consulted to a number of major companies and currently serves on the board of several software and Web companies. He has an MBA from Harvard Business School and an undergraduate degree in physics and astronomy. He plays bridge, races sailboats, and is based in New York City. Volume: There are many sources of ratings. 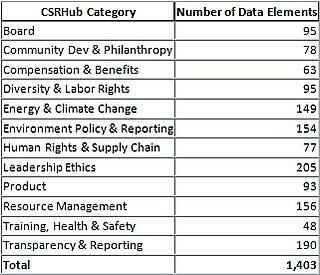 CSRHub currently tracks more than 530 sources of CSR information and plans to add at least another 30 sources over the next six months. Our system already contains more than 120,000,000 pieces of data from these sources that touch more than 150,000 companies. We hope eventually to expand our coverage to include several million companies. 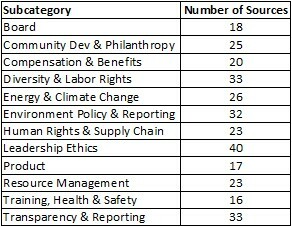 Variety: Each of these 530+ sources uses different criteria to measure corporate sustainability and social performance. 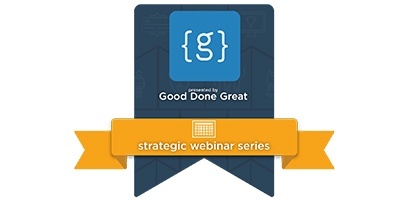 A number of comprehensive sustainability measurement approaches have been created. Unfortunately, each new entrant into the area seems compelled to create yet another system. Velocity: With hundreds of thousands of companies to measure and so many measurement systems, the perceived sustainability performance of companies constantly changes. Many of the available ratings systems track these changes only on a quarterly or annual basis. Some research firms try to streamline this process by sending out a questionnaire that covers all the things they want to know. Then, they follow up to encourage companies to answer their questions and follow up again after they receive the answers, to check the facts and be sure their questions were answered consistently. An NAEM survey showed that its members were seeing an average of more than ten of these results in 2011. This number has continued to grow and some large companies say they receive as many as 300 survey requests per year. Co-founder and COO, Cynthia Figge, will be moderating the Performance Drivers: Big Data, Transparency and CSR panel. This conference will be held on April 20th in San Francisco, California. CSRHub will also be a strategic partner of this conference. Skytop’s CSR 2.0 Conference will be attended by Corporate Responsibility Officers, Heads of Marketing and Strategy, and Human Capital Executives, with the goals of engaging, discovering as well as applying corporate social responsibility strategies. For more information, please click here to visit Skytop Strategies website for the conferences agenda.